A team of archaeologists led by Ian Hodder, professor of anthropology and of classics at Stanford, has unearthed an about 8,000-year-old figurine at Çatalhöyük, a Neolithic site in central Turkey. The figurine, wrought from recrystallized limestone between 6300 and 6000 B.C., is a rare find in a place where most previously discovered pieces are sculpted from clay and deformed over millennia in the soil. Conventionally associated with fertility goddesses, this figurine is also thought to represent an elderly woman who had risen to prominence in Çatalhöyük’s famously egalitarian society. Hodder, who oversees the Çatalhöyük Research Project, learned of the discovery earlier this year when he received a call from Arek Marciniak, a Polish archaeologist, whose team had been digging in the southern part of the site when they unearthed the figurine. “I rushed up to find a group of Polish archaeologists staring down at this white shape that was beginning to appear in the soil,” recalled Hodder, who “realized immediately that it was a very special find.” Excavators had hollowed out a large dwelling, where its former occupants had deposited the figurine in platforms built atop earlier structures. At the platform’s far southeast corner, abutting the wall, the archaeologists found the figurine. Left of the first figurine lay an obsidian blade, and nearby sat another figurine of lesser quality, hewn from yellow limestone, next to a piece of galena. Hodder quickly summoned his team to the trench, where a photographer snapped photos and researchers made preliminary assessments. The stone figurine measures 17 centimeters (6.7 inches) long and 10.96 centimeters (4.3 inches) wide, weighing in at 1 kilogram (2.2 pounds). Aside from oddly small hands and feet, it reflects “a good and pragmatic knowledge of the human body,” according to a report by Hodder’s team, whose members include Lynn Meskell, Stanford professor of anthropology, and Lindsay Der, who recently completed her PhD in anthropology at Stanford. What sets this figurine apart from so many others is not its appearance, but its craftsmanship. 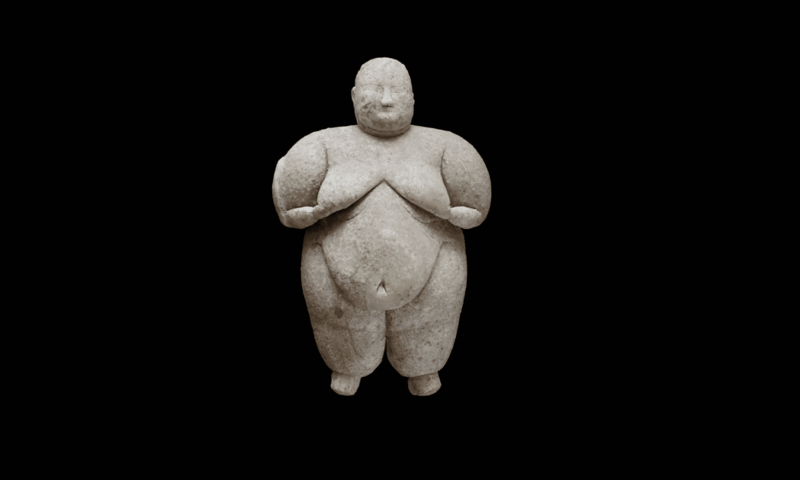 Goddess figurines at Catalhöyük usually depict a woman with her hair tied in a bun, plump, with sagging breasts and a pronounced belly, suggesting maturity. The figurine in question contains a few unusual features: elaborate fat rolls on the limbs and neck; the arms separated from the torso; and an undercut below the belly to separate it from the rest of the body. Such detail is only possible with thin tools, like flint or obsidian, in the hands of a practiced artisan. Millennia of weathering in the soil has erased evidence of the figurine’s handling. While of exceptional quality, this figurine was not of exceptional purpose. Goddess figurines were common in the Neolithic period, crafted throughout southeastern Europe, the Middle East and Anatolia, the region in central Turkey where Çatalhöyük once flourished. While they have long symbolized fertility, a more recent theory suggests otherwise. Meskell is among a handful of scholars who posit that the Neolithic figures at Çatalhöyük may “represent older women who have achieved status.” Whether they rose to the level of goddesses, though, is unclear. Gods or not, the elderly in Neolithic Çatalhöyük may have held elite status, performing rituals and making decisions that impacted the entire community. Fatness may have been a sign of social standing and of age, with calorie-burning manual labor replaced by sedentary religious and political duties. But as a status symbol, the figurine might always signal a shift from a sharing to an exchange economy, where resources could be accumulated unevenly. In sharing economies like Neolithic Çatalhöyük, resources were often pooled, while later civilizations, most notoriously ancient Rome, favored exchange economies that led to vast social inequality. “We think society was changing at this time, becoming relatively less egalitarian, with houses being more independent and more based on agricultural production,” Hodder said. The figurine, with its fine artistry, sat in the newer parts of the site. Its location near the surface means that it was buried later – that is, well after Çatalhöyük civilization had peaked, when fatness symbolized high status in a stratified society rather than an elevated place in a society of equals, he said. Whatever form this metamorphosis may have taken, it did not happen overnight. Humans first settled in Çatalhöyük around 7500 B.C. in an area overlooking the Konya Plain, now in present-day Turkey. The settlement reached its peak around 7000 B.C. and was abandoned around 5700 BC. Excavations at Çatalhöyük first began in 1961 under James Mellaart, a British archaeologist, whose digs continued through 1965. Though discontinued after the Turkish government banned Mellaart, the excavations revealed Çatalhöyük to be a large Neolithic settlement, with over a dozen layers of ruins coinciding with different stages of history. The site remained untouched until 1993, when Hodder established the Çatalhöyük Research Project, an international group of archaeologists and specialists from over a dozen universities. Excavations in the ensuing years have enjoyed wide sponsorship, including the backing of the Turkish government. The Neolithic site of Çatalhöyük was designated a UNESCO World Heritage Site in 2012.